The first Space Shuttle External Tank rolls off the assembly line on Sept. 9, 1977. 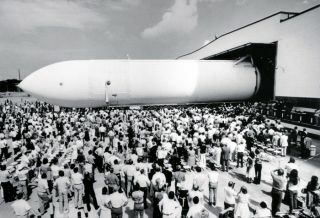 In this historical photo from the U.S. space agency, the first Space Shuttle External Tank (ET), the Main Propulsion Test Article (MPTA), rolls off the assembly line on September 9, 1977 at Michoud Assembly Facility in New Orleans, Louisiana. The MPTA was then transported to the National Space Technology Laboratories (currently called Stennis Space Center) in southern Mississippi where it was used in the static test firing of the Shuttle's cluster of three main engines. Marshall Space Flight Center was responsible for developing the External Tank. External Tank contains two tanks, one for liquid hydrogen and one for liquid oxygen, and a plumbing system that supplies propellant to the Main Engines of the Space Shuttle Orbiter.